You care about farmers and ensuring future access to local, sustainable food, right?! So here's your chance to make a difference. 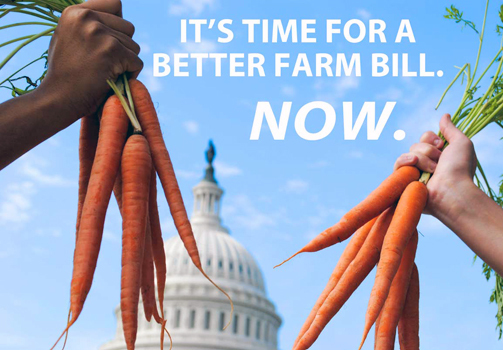 With just two calls, and perhaps a few clicks on online petitions, you can weigh in how our tax dollars are going to be spent on our food system. Step 1: Select your talking points from the list below. Step 2: Call your senators. Click here to find them. Step 3: Thank them for representing your interests! 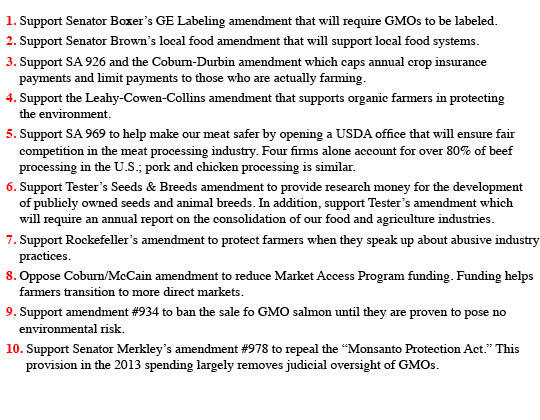 Below you'll find not just ten reasons to make the call, but ten amendments that our senators need to hear from us on. You can also check out the recommendations of these organizations too: Live Real, Center for Food Safety, and the Organic Trade Association, but whatever you do, you've got to do something for a more sustainable and equitable food system for all! In addition to these, you may want to consider voicing your support for Senator Boxer's amendment #1027 to protect honey bees and native pollinators, which, according to the Center for Food Safety, have declined by over 45% since last winter due to pesticides and Big Ag. Thank you for all that you do for our farmers and local food!